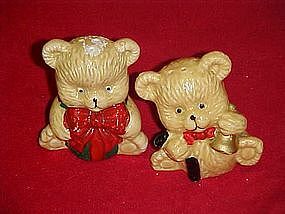 Vintage teddy bear shakers with big burgundy bows. One holds a Christmas bell. Made of heavy porcelain or stoneware. Plastic stoppers. I have the matching cookie jar listed also (item safn-9208). These little bears are in perfect condition, and measures about 3" tall.